Total 2018 announced net profit was at about VND243 trillion, up 18.0% compared to 2017. However, if excluding the extraordinary profit of VHM (up nearly VND13,000 billion), the total net profit only grew 11.8%. Overall ROE of the market reached 14.0%, down from 14.5% in 2017; while ROA edged up from 2.5% to 2.7%. 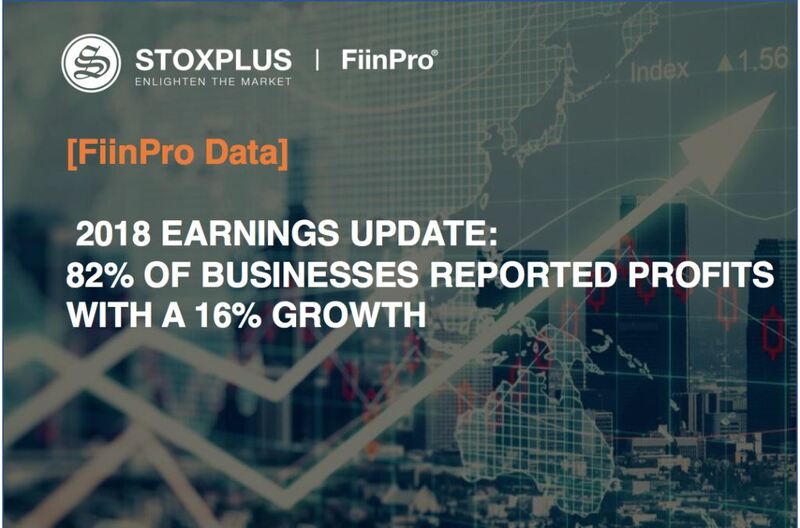 557 companies reported profits in 2018, accounting for 83% of businesses that announced Q4/2018 financial statements. Some notable companies with the largest profits were VCB (VND 14,641 billion), VHM (VND14,223 billion), GAS (VND12,102 billion) and VNM (VND10,227 billion). 307 companies achieved their planned profits, accounting for only 45.7% of businesses that announced Q4/2018 financial statements, including GAS (188.3%), MSN (158.4%) and VEA (144.1%). Companies with the strongest growth in 2018 included VHM (909.7%), ACB (142.5%), ANV (321.5%) and MSR (222.3%). Real Estate sector led the profit growth with an increase of 78%, mainly due to the sudden profit from VHM. Excluding VHM, profit of the whole industry only rose 15.6%. Total profit announced by 54 companies reached about VND36 trillion, equivalent to 83% of the sector’s profit plan. In Q4/2018, total sector’s profit reached VND11,915 billion, growing 103.7% compared to Q4/2017. Companies with the highest Q4 profits were VHM (VND2,347 billion), NVL (VND1,859 billion) and VIC (VND 1,638 billion). In 2018, the Real Estate sector saw a fairly equal growth among segments with 65% in Industrial Real Estate Development, 88% in Residential Real Estate Development and 84% in Office Real Estate Development. The sector’s ROE was improved from 9.7% to 11.3% while ROA rose from 3.2% to 4.4%. 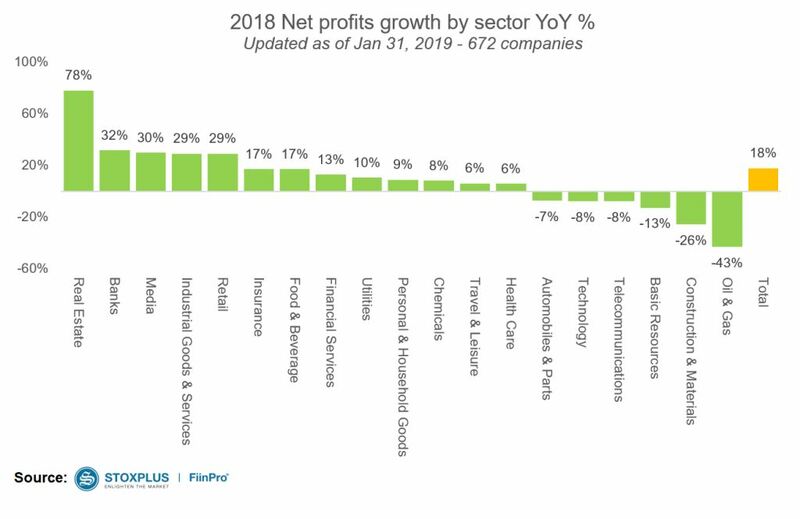 Despite some signs of deceleration, Banking sector showed profit growth of 32% in 2018, the second highest among sector groups. So far 16/17 listed banks have published data with a total profit of VND65.8 trillion, hitting 102.1% of the planned figure. 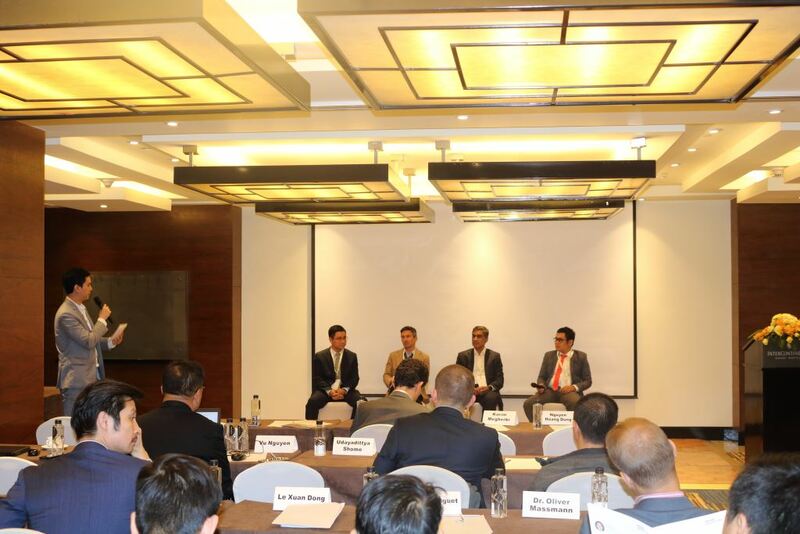 In Q4/2018, many banks reported loss or negative growth such as CTG (VND687 billion loss), EIB (VND247 billion loss), BID (down 36% yoy), LPB (down 45% yoy). Total Q4/2018 profit hit VND16,916 billion, up only 13% compared to Q4/2017. 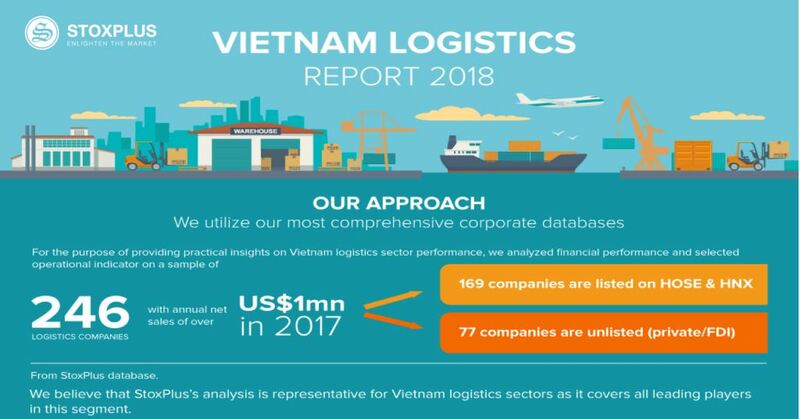 In Q4/2018, the sector’s net interest income reached VND44,587 billion, up 3.2% compared from Q4/2017 and down 6.2% from Q3/2018. 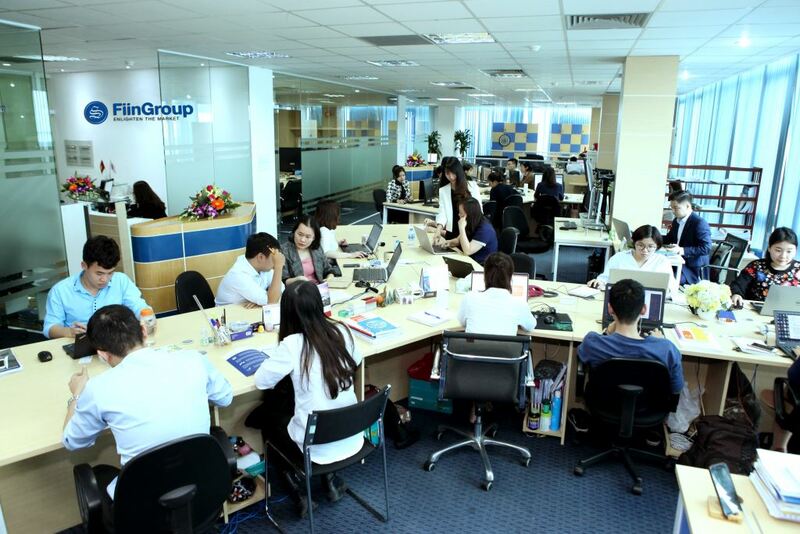 During the period, CTG’s net interest income was only VND572.5 billion, down sharply from VND7,507 billion in Q3/2018. Loans and advances to customers of 16 above-mentioned banks hit VND4,160 trillion, up 13.5% from the beginning of the year but only 1.7% from the end of Q3/2018. Oil & Gas only gained a total profit of VND5,185 billion, down 43% compared to 2017. The main reason was the reduction in profit of 53% and 28% for BSR and OIL respectively. These are 2 tickers with IPO in 2018. Excluding them, the sector’s profit grew 35% with the contribution of PVD (up 315%) and PVS (up 28%). The sector’s ROE declined from 12.6% in 2017 to 7.5% in 2018. Similarly, ROA also dropped from 6.6% to 4.3%. Construction & Materials achieved a total profit of VND10,683 billion, down 26% compared to 2017 and reaching only 79% of the year’s plan. ROS and CII led the decline in profit with of 78% and 94% reduction respectively. 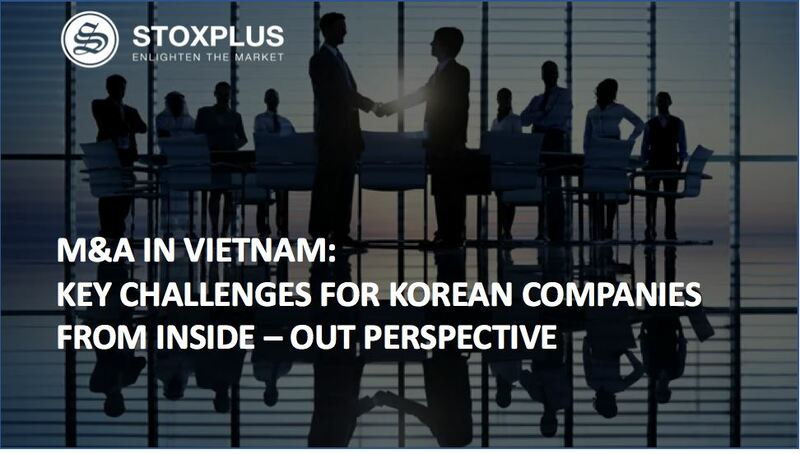 In 2018, ROS only achieved VND186 billion profit compared to VND849 billion in 2017, while CII only earned VND86 billion compared to VND1,514 billion last year. 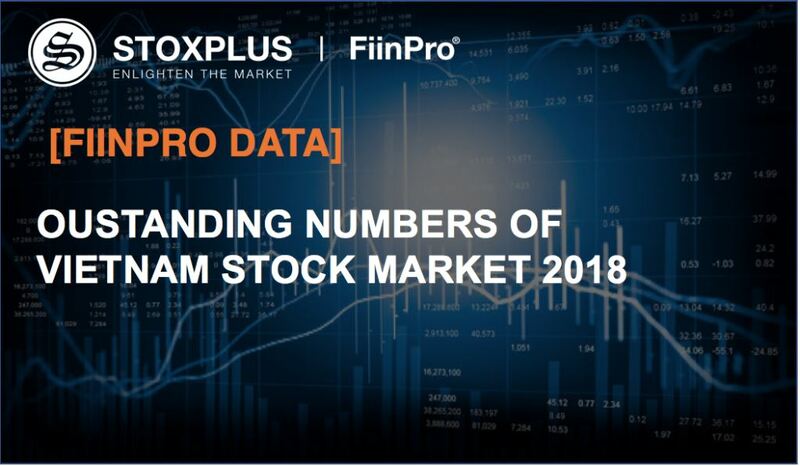 For more detailed data, please see on FiinPro Platform or download aggregate data here. 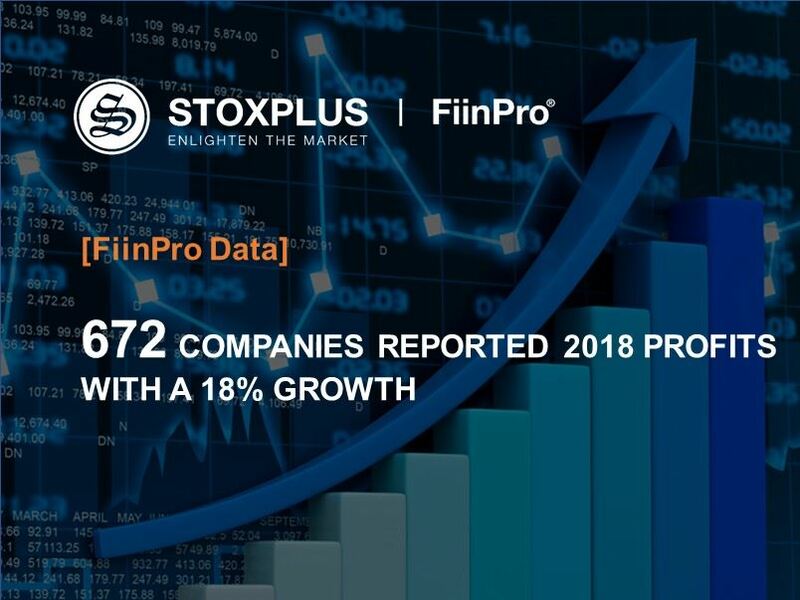 This report is the property of STOXPLUS Corporation (STOXPLUS), the information provided in this report is based on sources believed to be reliable, but their absolute accuracy completeness or correctness are not guaranteed. This document is not intended to be provided at the request of any organization or individual, nor does it serve the purposes of advertising, selling, buying or holding securities. All views expressed in this report are based on fairness, neutrality and reasonable in the circumstances prevailing at the time. Customers and investors should only use the information provided in this document as a reference, we are not responsible for any loss to the use of the information mentioned above. All acts of copying, modifying, printing, reprinting in any form of any individual or organization without the consent of STOXPLUS are illegal.